"This is what I'm doing to protect my family and my finances - I recommend you do the same." Do you believe America's financial problems from 2008 have been fixed? Do you think we are on the brink of another banking crisis, or a problem with our currency? We are now facing serious economic problems in the United States. And it's about to get much, much worse. In recent months, we've seen nearly $8 trillion disappear from world stock markets... and a whopping 70% of investors lose money in 2015. Even the great Warren Buffett lost $11 billion dollars. We're looking at a collapse in corporate bonds.. and plummeting oil and commodity prices. Research shows the "too big to fail" banks, the top five largest financial institutions (the ones that were bailed out in 2008), are now 25% bigger than they were back then, and more dangerous than ever. We've seen private businesses take on more debt than any time in the past 12 years, and an incredible 863 companies that have had their credit rating downgraded last year... the most since 2009. I mean... even Wal-Mart announced the shutdown of more than 250 stores, worldwide. This is what happens when our government embarks on a gross, out-of-control experiment, expanding the money supply 400% in just six years, and more than doubling our national debt since 2006. It took our nation 216 years to rack up the first $8.5 trillion in debt... then just 8 more years to double that amount. America is in for some major changes to our economy, our country, and our very way of life over the next five years. The way you live, work, travel, retire, invest... everything is going to change. Some of it in ways most people would never expect. A "new" crisis of epic proportions is already underway. Stocks will fall further. Bonds are going to collapse. Huge numbers of bankruptcies in the energy business may soon ripple through the financial system. And eventually, we're going to have a major stock market crash -- and it will be worse than the one we experienced seven years ago. We're going to have a currency crisis too - because investors and governments around the world will realize the U.S. dollar is not the safe haven it once was. Sooner than most people think, we'll see the U.S. dollar lose it's "reserve currency" status, and this will make it much harder for our government to borrow money, and have our military stationed in more than 150 countries. "If the currency collapses, everything else goes with it... stocks, bonds, commodities, derivatives and other investments are all priced in a nation's currency. If you destroy the currency, you destroy all markets and the nation." We're going to have massive changes to our retirement system and Social Security. We're likely to see huge tax increases and even a "wealth tax," which levies a fee on all your savings and any assets of value. We're going to see all kinds of new laws and rules about what you can do with your money, just like House of Representatives bill H.R. 2847, which went into effect July 1, 2014. This law made it extremely difficult, if not impossible, for the average American to get some of his money out of U.S. dollars, and into more stable currencies via foreign banks. In the months and years to come we're going to see more and more of these "capital controls" placed on our personal savings... We're going to have a massive inflation -- when the trillions and trillions of newly printed dollars begin making their way into the economy. We'll also witness major changes to the very fabric of our society. Destroying a nations' money in this manner wrecks businesses, friendships, and families, who simply don't understand and aren't prepared for what will happen. Violent crime is skyrocketing in major cities. It's going to get much worse before it ever gets better. Please learn how to protect yourself and your family. Believe me, I don't take these predictions lightly -- and I have no interest in trying to scare you. I'm simply following my research to its logical conclusion. I did the same thing when I was one of the first analysts to accurately predict the collapse of the world's largest mortgage bankers -- Fannie Mae and Freddie Mac. I did the same when I dug into the finances of GM and realized this once great American institution would soon go bankrupt as well. I did the same General Growth Properties (the biggest owner of mall property in America). When I first presented my case and exposed the facts about these institutions at economic conferences, people got angry. They couldn't refute my research... but they weren't ready to accept the enormity of the conclusions either. And now, the same financial problems I've been tracking from bank to bank... and from company to company for the last decade have found their way into the U.S. Treasury. The next phase of this crisis will threaten our very way of life. The savings of millions will be wiped out. This disaster will change your business and your work. It will dramatically affect your savings accounts, investments, and retirement. It will change everything about your normal way of life: Where you vacation... where you send your kids or grandkids to school... how and where you shop... the way you protect your family and home. I know many people see the recovered stock market, the rebound in real estate prices, and want to believe everything is "back to normal." But I promise you, nothing is "normal" about what is happening in America today. It is all smoke and mirrors -- the result of an out-of-control government experiment with our money supply. Roughly 75% of Americans are living paycheck to paycheck, with essentially zero savings, according to a recent study by Bankrate. How can things really be "normal" in America, when the number of people on food stamps has basically doubled since Barack Obama took office... and when HALF of all children born today will be on food stamps at some point in their life? Yes, you read that correctly: Roughly 50% of all children born in America today will be on food stamps at some point in their lifetime. Does that sound "normal" to you? Can our country really be back to "normal" when, according to the most recent numbers from the Census Bureau, an incredible 49% of Americans are receiving benefits from at least one government program EVERY SINGLE month? Or when 52% of all American workers make less than $30,000 a year? Can things really be "normal" in America when at one point, a single U.S. government-controlled agency (the Federal Reserve) was purchasing up to 70% of the bonds issued by the U.S. Treasury - simply by creating money out of thin air? Or when the "too-big-to-fail-banks" that got bailed out in 2007 are actually 25% larger than they were back then? It shows that what has taken place over the past few years with the U.S. dollar is something straight out of Weimar Germany... or the last 20 years in Zimbabwe. Like I said, there are clear signs that the next big crisis has already started. What's going on today certainly isn't "normal." And it's guaranteed to end in a disaster for millions of Americans who don't know how to protect themselves. This is why I recently put together a 300-page Blueprint, detailing the exact steps I'm taking to prepare for this inevitable crisis. I strongly encourage you to take these simple steps too. My new work is called: America 2020 -- The Survival Blueprint. This is a handbook, a blueprint, and an owner's manual for how to protect yourself and your family over the next five years. "This book is a must read. I don't know of anyone who has spent as much time and money as Porter Stansberry, figuring out how to protect yourself and prosper in the years to come…"
The next big crisis in America is NOT going to be a "banking crisis" like we had in 2007. It's going to be a currency crisis that's much bigger... and government bailouts aren't going to do a damn thing to help. 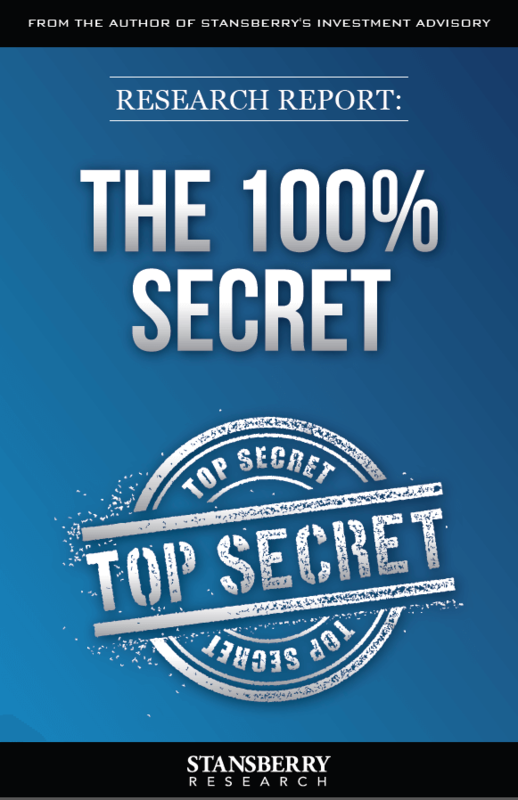 I'm giving away my 300-page Blueprint at a HUGE DISCOUNT to any U.S. resident with a domestic postal address. Keep in mind: This book is not for sale ANYWHERE ELSE. The only other way to get your hands on it is in the second-hand market. As I write this, there are a handful of copies available on eBay. One of the cheapest offers for a hardback copy I've seen is $70. The most expensive is $123. But you don't have to pay anywhere near that price. Not even close. When you take advantage of this offer today you'll pay just $19. And that includes FREE shipping. Why am I giving away so much valuable information for basically what it costs us to produce, print, and ship this book? For one, it's the right thing to do. The American people deserve to know what our government has done, what's coming next, and what you must do to protect yourself and your family from the disaster our government has created. Many of the smartest people in the industry... like CIA and Pentagon insider Jim Rickards... hedge fund multimillionaire Jim Rogers... and superstar investor Kyle Bass (the minimum to invest with Bass is $5 million), are all taking precautions against what's now unfolding. And Bass built a 41,000 square foot ranch stocked with firearms and gold. But now, with "The Survival Blueprint," there are easy ways for every American to protect their family and their wealth, no matter how much you have in the bank. I know that the fewer people who are prepared, the worse this crisis is going to be. The second reason I'm giving this information away so cheap is I know my Baltimore-based firm (which I started 17 years ago) does the best work in America when it comes to retirement, investing, and protecting your assets and your family. I know that if I can help you protect yourself from the disaster that's underway, by sending you a copy of one of my firms' most important pieces of work at essentially my cost, you might become a raving fan and a loyal subscriber over the long term. It's my favorite strategy for business and in life: Under-promise and over-deliver. This is how I've built one of the largest independent research firms in the world, with more than 500,000 paid subscribers from 120+ countries. That's more subscriptions than many of America's most popular financial newspapers, including Barron's and Investor's Business Daily. And I know that rather than TELLING you about our work... the best thing I can do is simply SHOW you what we do, with a great sample -- and no obligation for you to ever purchase anything from us ever again. I have personally already taken the necessary steps to protect myself and my family from the inevitable crisis, now unfolding. But I know literally millions of hardworking Americans have not done a thing - or have not done enough. And that is why my America 2020 -- The Survival Blueprint is packed with literally dozens of useful ideas that will help protect you and your family. Most Americans don't know there are three legal assets that you never, ever have to report to the government. Yes, you still have to pay taxes if you earn income on these assets or sell for a profit, but you LEGALLY DO NOT have to tell the government or anyone else in the world that you own them. Nothing is more dangerous than a broke, desperate, and well-armed government. The less the government knows about where you have your money, the better. They will simply have a very hard time taking what they don't know you have. Every American needs to get some money beyond the government's reach. But the good news is, there is one asset you can own (now widely available in America), which should help protect you and your family from this chaos... and could also likely make you a small fortune in the years to come. In fact, an index tracking this asset has absolutely crushed the stock market. Since 1992, it's returned well over 1,000% gains. Best of all, it provided these gains with almost no volatility. Just look at the chart below. See how that black line goes straight up, without any hiccups? Multimillionaire investor Barton Biggs, who has done exhaustive research on which types of assets survive a crisis, said this particular asset has historically "protect[ed] both your wealth and your life." During World War II, for example, when millions of families lost their entire life savings through inflation or government seizure, this was the one asset that enabled some families to survive... and to protect, preserve, and grow their money. That's why it's an asset so many of the richest people in the United States are buying. I'm talking about the Walton family (of Walmart fame), Bill Gates, Ted Turner, the Hilton family, Charles Schwab, Microsoft billionaire Paul Allen, the Hunt family (of Texas oil fame), the Hearst family, the Ford family, and more. As my multi-millionaire friend Doug Casey says, it's the ONE THING you should own in the years to come. Look, I can't tell you exactly how bad things are going to get, or how quickly it will all happen. No one can. I can only tell you that I'm certain they'll occur. And that our country will look very, very different in 5 years than it does today. Just remember: We as Americans are not immune to the basic laws of economics and finance. That is: Print money in massive quantities to pay growing, insurmountable debts. In just the past 100 years, for example, we've seen this scenario play out in Germany, Russia, Austria, Argentina, Brazil, Chile, Poland, the Ukraine, Japan, and China, just to name a few. In every case, in every instance, printing and borrowing money on such levels has ALWAYS led to financial and economic crisis. Today, that process is well underway in the United States. The point is, you absolutely must take the necessary steps now to protect yourself and your family. Today, we as a nation owe more money to more people than any nation in history. We owe more money than all of the European Union combined. And U.S. debt per person is more than twice as much as in the E.U. Back in 2014, they pointed to a rising stock market... recovering real estate prices, and declining unemployment. They said, "Hey, things are back on track." But now it's clear there has been no recovery -- and the situation is going to get much worse, before it ever gets any better. Nearly 70% of Americans lost money in the markets in 2015. And this year things are even worse. The overall stock market fell more than 5% in January -- one of the worst starts to the year in stock market history. Serious strains are emerging in almost every corner of the global credit market. Bloomberg says credit ratings downgrades are higher than they've been in 7 years. And of course, we continued piling up more debt in fiscal year 2015... adding another $326 billion. As of February 1st of this year, we topped $19 Trillion in total national debt. Meanwhile, our government would have you believe (without any proof whatsoever), that it can order the Federal Reserve to prevent interest rates from ever rising to a level that would cost the American people or the government anything. And most of our politicians believe (again, without any proof whatsoever) that they can stimulate the economy by even more deficit spending, so that it grows faster, allowing tax revenues to produce a surplus. But you know better, my friend. You must know better. The only question is: Will you take the necessary steps to be ready? You will if you read and take the simple steps detailed in my 300-page America 2020 -- The Survival Blueprint. And that's why I want to send you essentially a free copy. Again: All I ask is that you pay $19 to get a hard-backed copy shipped to your home. This $19 fee basically covers my costs to produce, print, and ship this book to your home. The smartest moneymen in America are making preparations right now... shouldn't you? "We've told all of our clients that if you only had one idea, one investment, it would be to buy an investment in a non-dollar currency. That should be on top of the list." "I believe the dollar could lose its status as the world's reserve currency and medium of exchange, something that would lead to a huge decline in the standard of living for U.S. citizens like nothing we've seen in nearly a century." Even Warren Buffett, the world's most renowned investor with a net worth of $59 billion, has reduced his company's bond holdings to their lowest levels in more than a decade, according to Bloomberg News. What Bloomberg didn't mention is that Buffett also moved almost 70% of his remaining government fixed-income investments into foreign currencies. Then, in recent years, Buffett spent a fortune on a business that will probably see sales quadruple when a big crisis hits. This business produces one of the most important things everyone needs to keep your family safe in just about any type of crisis. Now... I know... the ideas and solutions I'm encouraging you to take might seem somewhat radical to you at first... perhaps even "un-American." But the truth is, I'm recommending these steps because I love this country, and I want to see as many people as possible emerge from the mess our government has put us in. Believe me, the fewer people who have to rely on the government for help, the better off we'll all be. 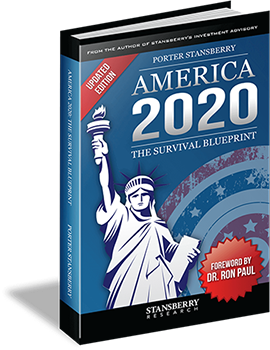 When I send you your copy of America 2020 -- The Survival Blueprint, there are three other Research Reports I've been working on that I want to give you immediate access to as well, all totally free of charge. This research details a remarkable opportunity created entirely by government policies and by the government's massive money printing. It explains an interesting way just about anyone in America can make up to 500% gains, tax-free, in the years to come... without touching stocks, bonds, or precious metals. Several of my colleagues and I have moved huge portions of our personal investment portfolios into this unique opportunity. 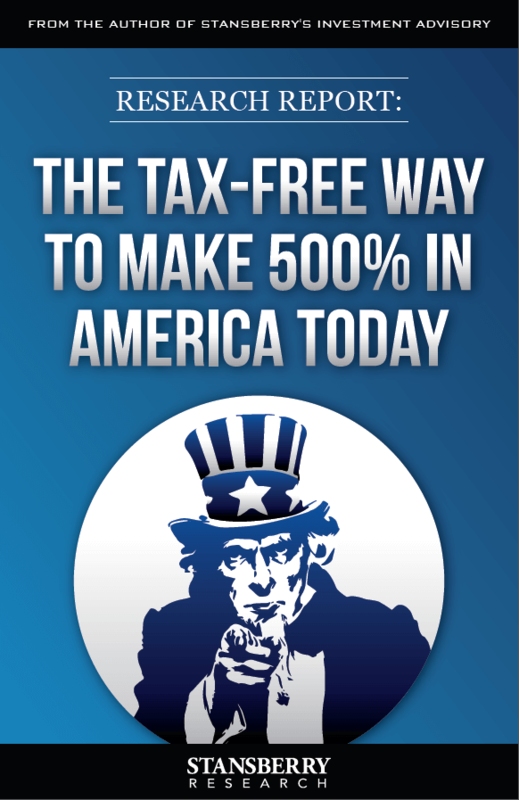 My business partner Dr. Steve Sjuggerud calls it, "The last great tax shelter in America." And we show you a simple formula that allows you to judge the quality of these investments very quickly. Again, this is totally separate from the stock and bond market, and allows you to get a large chunk of your money out of the financial system. 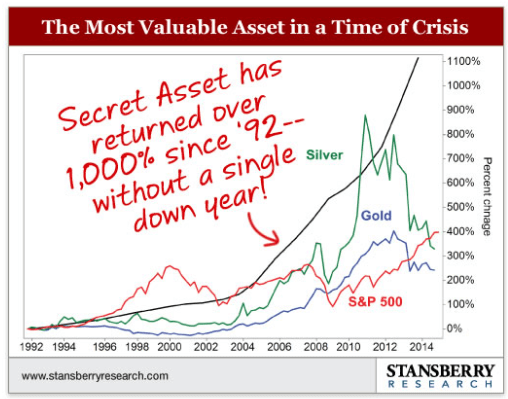 Most people know gold is a good investment to protect against what could happen in a crisis, but most people don't have a clue about the best way to buy or store it. That's why we created this 152-page Manual. 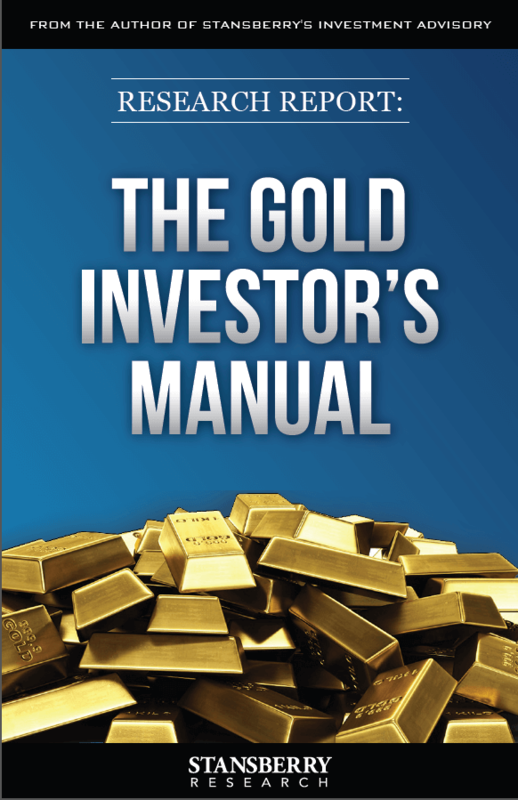 It reveals dozens of secrets about the gold industry... specifically the best ways to buy, sell, and store your gold. It explains why some gold coins are better than others. How to buy gold with ZERO dealer markup. How to easily and safely store some of your gold overseas, very cheaply... where to hide it... the best ways to buy gold and to have it stored in a secure location in the United States or overseas... and more. I will be surprised if gold does not reach $5,000 an ounce or $6,000 an ounce in the next few years. Currency expert Jim Rickards says it could reach $7,000 per ounce. If you want the opportunity to make a lot of money during the coming crisis, one sure way to do it is to learn the intricacies of an unusual investment strategy we have been teaching our readers to use for several years. You don't have to buy a single stock to begin using this strategy... and it has nothing to do with "shorting." Learning this technique can be a game-changer. In fact, you might never want to buy stocks the "ordinary" way ever again. One of our readers named Tommy H. described the impact of learning this secret. He said: "This has saved my portfolio." In short, we'll show you a way to extract gains of 100% potentially without ever owning a single stock. As Pulitzer Prize winning author James Stewart said: "[These payouts] are so rich I consulted a colleague to make sure they were real." Like I said, all three (3) of these Research Reports are totally FREE of charge. I'll also give you a free 30-day trial subscription to my monthly research report, called Stansberry's Investment Advisory. In my monthly research report, I will regularly update you on the currency situation, the unintended consequences of the Fed's money printing, and best ways to grow and protect your money over the next few years. My Investment Advisory Service, which you'll receive on the first Friday of every month, is the perfect way to stay up-to-date on the currency crisis taking place in America right now. You'll pay just $19 to get all of this Research delivered to your doorstep. I can't imagine there's a better deal anywhere in the financial world. If you like our work, great -- I hope you'll want to keep reading our research and insights in the future. We'll bill your card a refundable $149 for a full 1-year subscription after your 30-day free trial is over. This is a fast-moving situation... with lots of moving parts. I have six very smart analysts working with me to stay up to date, in my Investment Advisory every month. One is a certified public accountant... another is an expert on science and technology... another is a former money manager... another is lawyer with expertise on various types of debt. I think you'd benefit substantially from receiving our work over the next few years... but like I said, if it's not for you, no problem. By paying just $19 today, you'll at least have the information you need to protect yourself from the disaster taking place in our country. 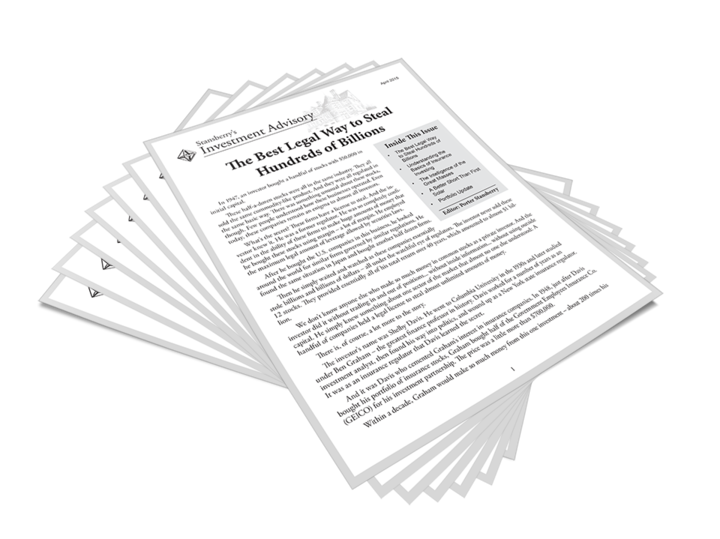 Plus, you'll receive access to a bundle of bonus Research Reports and a free thirty-day trial subscription to my monthly research report, Stansberry's Investment Advisory. And you are under no obligation whatsoever to buy anything else from me or my firm in the future. It's also important to keep in mind that: All of the steps I am recommending you take to protect yourself are simple, cheap, and easy... at least for now. But that will change very quickly as events unfold. I know, most people reading this will do nothing. They'll say to themselves: "I'll deal with that when the time comes." In the world of psychology, they call this the "normalcy bias." You see, the normalcy bias actually refers to our natural reactions when facing a crisis. It causes smart people to underestimate the possibility of a disaster and its effects. People believe that because something has never happened before... it never will. We are all guilty of it... it's just human nature. "By the end of 1935, 100,000 Jews had left Germany, but 450,000 still [remained]. Wealthy Jewish families... kept thinking and hoping that the worst was over..."
People "almost always are too complacent, because they cherish the illusion that when things start to go bad, they will have time to extricate themselves... It never works that way. Events move much faster than anyone expects... History usually doesn't evolve in a slow and orderly way; often it leaps forward in disorderly, chaotic jumps." This point is: Take these simple steps now, while it's all safe, cheap, easy, and 100% legal. Don't wait. If you do, it's very likely the situation will change so fast, it will be impossible for you to prepare. 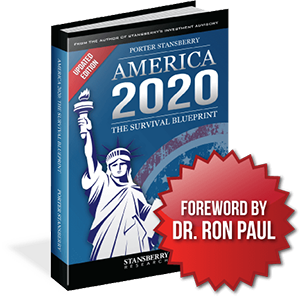 You can learn everything you need to know simply by requesting a copy of my America 2020 -- The Survival Blueprint. My 300-page America 2020 - The Survival Blueprint. You'll receive an electronic copy instantly, then a hardback copy in the mail, soon after. A FREE 30-day trial subscription to my monthly analysis called: Stansberry's Investment Advisory. There's absolutely no risk to you giving my work a look, either. And regarding a subscription to my Investment Advisory, if you don't find it useful for any reason, simply let me know before your free 30-day trial is up and you'll never be charged another penny. Or... simply let me know any time within 30 days AFTER your card has been charged for a subscription, and again... you'll get a refund for the subscription fee. The point is, I'm only suggesting you to TRY my work to see if you like it. If not, simply call our customer service team within 30 days and we'll issue you a full refund for your subscription charge. Get started today by clicking on the ORDER NOW button below. This takes you to a secure Order Form page, where you can review all the specifics of this deal once more, and enter the details on where you'd like your Survival Blueprint shipped. 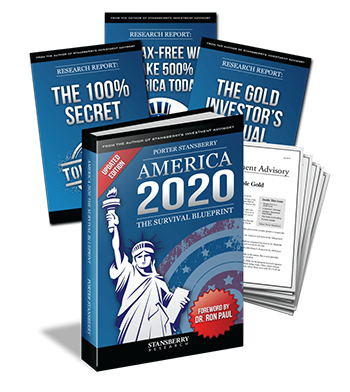 You'll receive electronic copies of America 2020 -- The Survival Blueprint, the three extra Research Reports I described, and access to my Investment Advisory in a matter of minutes -- immediately after placing your order. A printed version of America 2020 -- The Survival Blueprint will arrive on your doorstep, soon after.